ThermalTake introduces Allways Control, a new aluminium laptop cooler with two adjustable 70mm fans with air flow controllers. Switches let you control the air flow towards various angles and different directions. The device also has four USB 2.0 ports. Thermaltake, being an industry leader in computer chassis, thermal solutions, and power supply units announces the newest upgrade on life style notebook cooler –Sleek and compact, the Thermaltake Allways Control Notebook Cooler is the new functional laptop accessory. 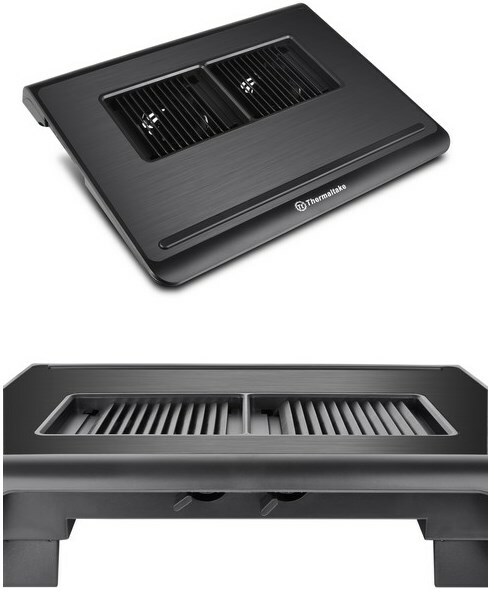 Dual, adjustable 7cm fans and an aluminum faceplate keep user’s laptop cool while rubber pads hold the laptop securely above with bottom supports allowing for the laptop at an incline or flat set up. With specific fan direction controllers designed, user can manually control the air flow towards various angles and different directions. It is completely USB powered and even features 4 USB ports, perfect for multiple devices connection. With built-in new air flow controlling technology, two fan direction controllers enable user manually control the fans on/off, air flow towards various angles and different directions. Additionally, there is a fan speed controller located at the side of the cooling pad enables an intuitive fan speed adjustment helping create a balanced cooling performance. Unique design fan ventilation design with dual 70mm silent fans for excellent cooling performance and better dissipation. Allways Control also features 4 USB2.0 port for easy additional USB devices.